Wow! What a way to start a rally! Saturday 6th January’s forecast of 43 degrees and catastrophic fire danger was followed by a pall of smoke approaching Bordertown Airfield from the north-west! 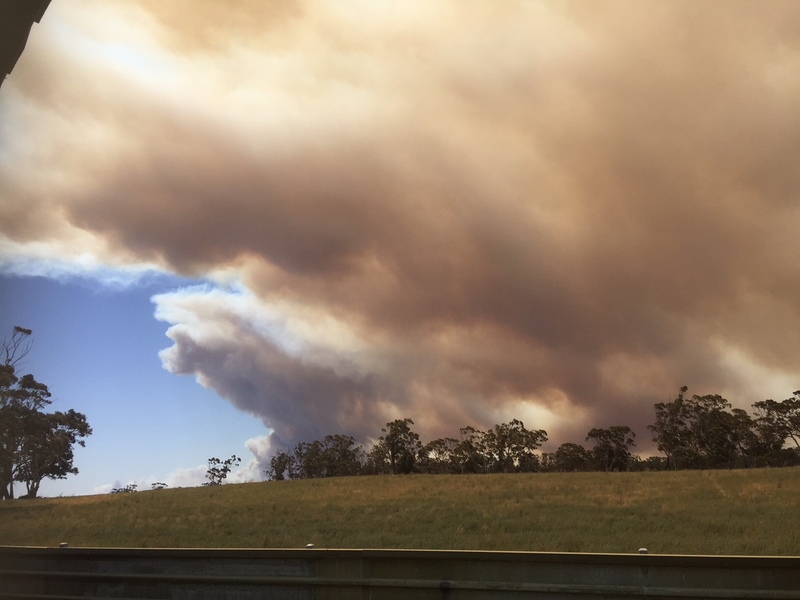 Evacuation plans were considered BUT thankfully the south-westerly wind change arrived about 90 minutes early, diverting the fire to our north, much to our relief! The pall of smoke over airfield and town remained for some time to remind us of our close escape! Oh, and no flying was done due to the high fire danger preventing winch operations. 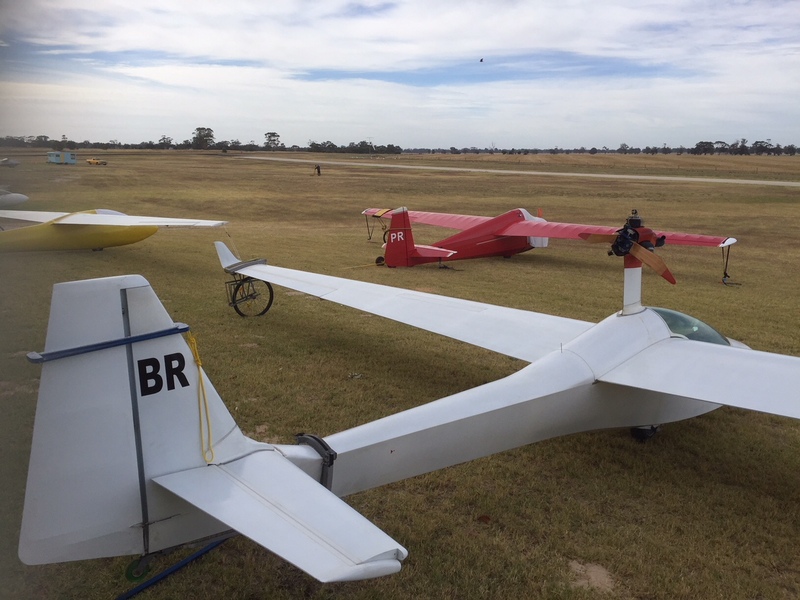 Altogether 9 vintage gliders and over thirty VGA members and visitors attended the rally, with the emphasis on social as well as flying activities. Other members and friends visiting included Noel Matthews, Alan Bradley, Ged Terry who popped in from England, Gary Crowley, Emilis Prelgauskas, Bob Hickman, Kim Van Wessem, Peter Fietz, Ian Caldwell, meteorologist Peter Bannister, Geoff Hearn, Sylvia Sharman, Tim Svenson, Alan and Margaret DeLaine, Bailey Roberts, Leigh Bunting, Ruth Patching, George and Helen Buzuleac, and Colin Collyer, who was unfortunately taken to hospital with a torn hamstring after tripping on a wayward trolley. 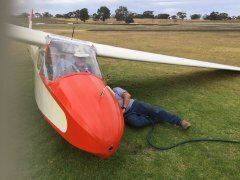 In addition Bordertown Keith members included Peter Brookman, Trevor Carter, Marcus Trnovsky, Brian and Jack Gerhardy, Terry Ryan, Adam Howell, Anthony Quilter, Damien Van De Velde and Gary Williams. Sunday’s weather after the change was much more pleasant but thermals were only going to about 4,000 feet. We rigged our aircraft and had a relaxing day as some winch problems interrupted flying. 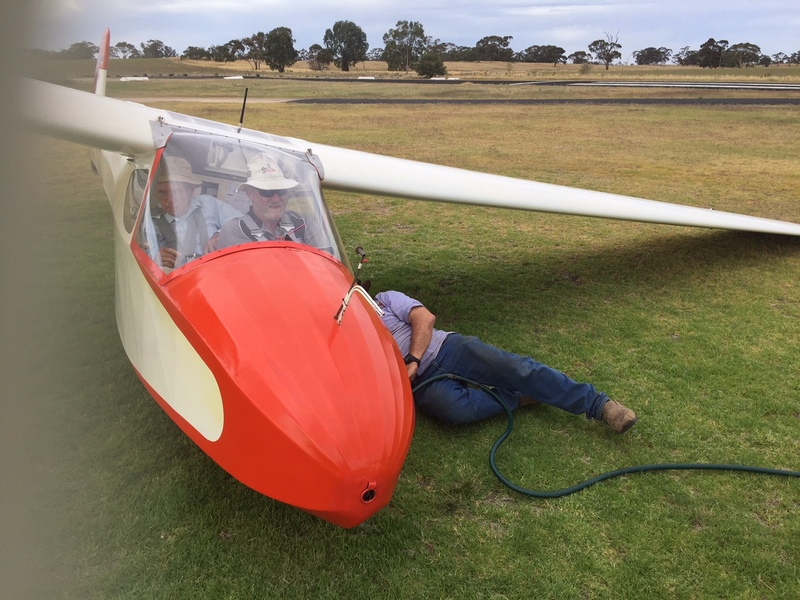 There were two Kookaburra winch launches and a Ka6E soared for a while after launching behind a friendly Super Dimona that dropped in – thanks to Cath and David Conway. By Monday the rally was in full swing with lift available to 4,500 feet and everyone keen to fly! Each day improved up until Thursday including many flights of up to 8,000 feet, and over 3 hours, were recorded. Wednesday an information evening about the Angel Flight was presented by Owen Crees, supported by Lucianne Van Gelder, and Denis Grosser. This wonderful voluntary organisation take up where other emergency services leave off, by providing air and ground transport to patients and family of those adversely affected by health issues, when recommended by a health professional. Rain on Friday effectively brought the flying to an end, however the VGA AGM at morning tea time brought some lively entertainment as issues and projects were discussed. 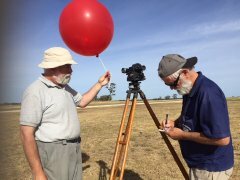 Winds on Saturday were good for kite flying with Leigh Bunting getting the best height and weatherman Peter Bannister recording best distance as his weather balloon disappeared interstate over the border into Victoria on a downwind dash. The VGA League 2 Trophy for the best League two flight during the rally was won by Peter Raphael in the Cherokee with 77 km. The Geoff Gifford trophy for the longest flight between rallies was awarded to Jenne Goldsmith for 360 km in the Ka6E. 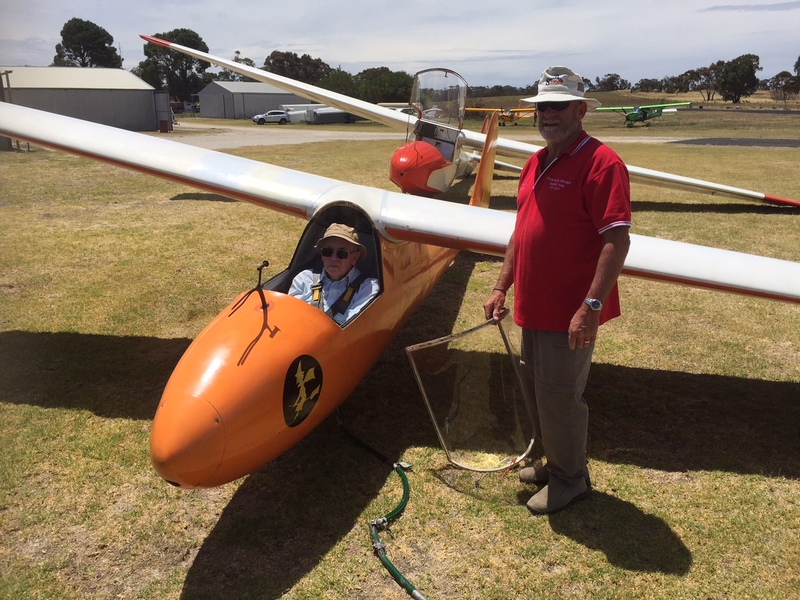 The Renmark Trophy for the longest flight of the rally went to Dave Goldsmith for 213 km in Ka6E VH-GEA. The best single seater was awarded to Ka6CR VH-HNA with John Mackley. 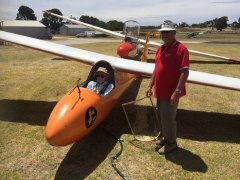 The best maintained Schneider Glider was won by Kookaburra VH-GNZ with Brian McIntyre. The Feathers Encouragement Award was also won by an enthusiastic John Mackley. The VGA Raffle was then drawn and the winner of Martin Simons’ fabulous book “The World’s Vintage Sailplanes 1908-1945” was won by Lyle Whitfield of Goulburn, who was delighted when informed of his win. Other contributed local prizes were also included in the raffle. Thanks to all those who bought tickets. 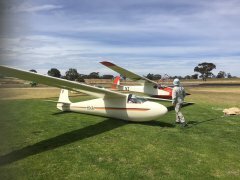 Then followed the inaugural “Patching Address”, named in remembrance of the Patching family contribution to Vintage Gliding. This year’s interesting and sometimes spine-chilling presentation was by Tony Mokunas about his many years flying in the wilds of New Guinea for regional airline Talair. Tony swears it is all true, and this was backed up by Noreen, the young bride he took with him! 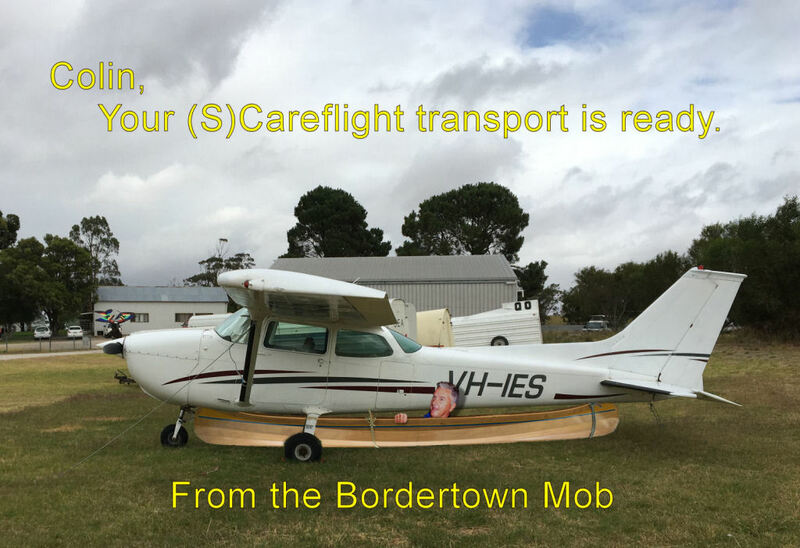 So, on Sunday morning we reluctantly said our goodbyes and started the journey home, vowing to keep in touch with our wonderful friends in vintage gliding until we all meet again for the next Bordertown rally to be held from 5th to 13th January 2019.